Recent tragedies involving gun violence are causing communities across America to engage in dialogue regarding our culture, especially issues such as promoting public and personal safety, preserving individual rights and providing high-quality mental health care. 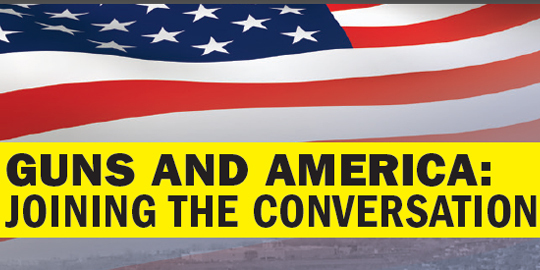 On Tuesday, Feb. 19, Syracuse University, as a signatory member of College Presidents for Gun Safety, will hold “Guns and America: Joining the Conversation,” the first in a series of moderated discussions about how these issues intersect in Central New York. This discussion is part of a national dialogue based on mutual respect, shared citizenship and finding common cause. The discussion will be held from 6:30-8 p.m. in Hendricks Chapel. Parking for the general public will be available in Irving Garage for $5. Main campus is also served by the Connective Corridor bus route. The keynote speaker will be Stephen Barton ’12, policy and outreach assistant for Mayors Against Illegal Guns in New York City and a victim of the July 2012 theater shooting in Aurora, Colo.
Robert Spitzer, Distinguished Service Professor and chair of the political science department at SUNY-Cortland. The panel discussion will be moderated by Grant Reeher, professor of political science and director of the Campbell Public Affairs Institute in the Maxwell School of Citizenship and Public Affairs. Sponsors for the event are the Office of the Chancellor, Division of Student Affairs and Hendricks Chapel, in cooperation with College Presidents for Gun Safety. Follow the conversation on Twitter at #SUguntalk. Editor’s note: This story has been updated to reflect the new event hashtag.